Most kids are back in school from being out for a couple of weeks. It’s now mid-year, and some kids have lost their motivation for school. For some of them, they looked forward to winter break all year, and now they don’t have much to keep them motivated. 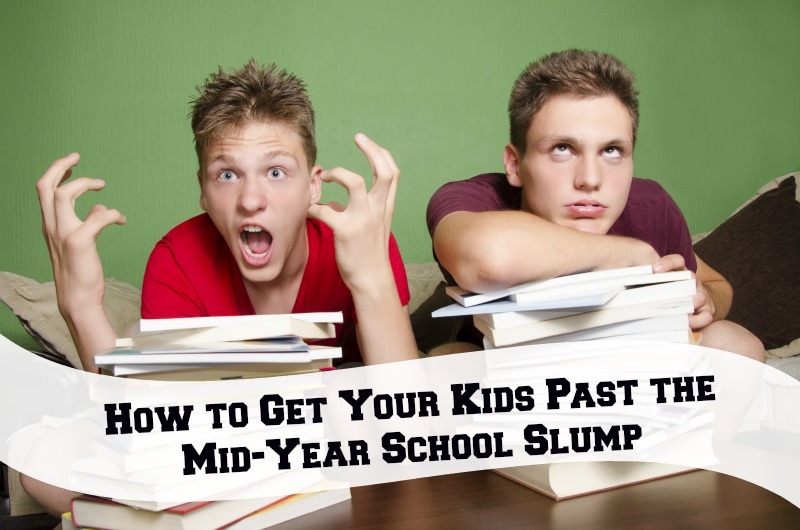 If your kids are in a mid-year school slump, check out these tips to get them out. Every kid has the potential to improve, even if it’s in a small way. Sit down with your kids and help them make goals. What kind of grades would they like to have by the end of the year? Where would they like to be at with their character? Making goals together can help any kid get past the mid-year school slump. One thing we’ve noticed around here is that our attitude rubs off on our kids, good or bad. Which is why we try to get excited about school, especially in the morning. Luckily, our kids love to learn, so it’s not as big of a deal to get them excited. However, if your kids are struggling with being exited, perhaps you can be that life source for them. Another thing that can get kids past the mid-year school slump is by planning a trip. It doesn’t need to be anything extravagant, but sometimes kids just need something to look forward to. Plan a trip to your local zoo or amusement park. You can use this as an incentive to help your kids focus on school now, so you can have fun later. School can come with stress, but on top of that, parents can add more stress onto their kids. Try not to stress your child out by putting unnecessary expectations on them. Stress isn’t fun for anyone, and it can drag a kid down quick. A tip would be to talk to your child in a civil tone when issues arrive. Less stress can help them feel excited about the rest of the school year. Think about how you feel when you’re stressed as an adult, it’s no fun! Sometimes kids don’t want to go back to school because they aren’t fond of their teachers or there may be a situation with another child. One thing that I’ve found is that by being involved, my kids feel more excited about school. I know what’s going on at school, which helps take a burden off their shoulders. Another way to get involved is by going to eat lunch with your kiddo at school or even picking them up afterschool for an evening of fun. Getting involved with your child can bring any kid out of a mid-year school slump. Getting through that mid-year slump is so important. Your child still has 4-5 months of school left, and they can’t lose momentum now! What tips do you have for getting your kids past the mid-year school slump?